Carbone is quite the scene. Waiters in tuxedos work the room with flair, the music is loud and the place is literally jumping with energy. It all looks like something straight out of a 1950s mob movie. We are a bit late for our reservation, which is probably a huge no-no here given the number of people who walk in and are politely given long waiting times, but luckily we are seated quickly. There is an air of secrecy to Carbone, almost like a private club. Many of the patrons are clearly regulars, including quite a few people from the worlds of show business, art and fashion. Partners Mario Carbone, Rich Torrisi and Jeff Zalaznick serve up classic Italian-American comfort food with a few twists. Spaghetti Puttanesca, Lobster Fra Diavolo and Veal Parmesan are all available, as are a handful of more simply prepared mains. The oversize menus are another flamboyant touch, but the descriptions are quite minimal, so its best to ask your captain about preparations as you enjoy the homemade bread and Parmigiano Reggiano on the table. There is something for every palate (and budget) on Carbone’s extensive wine list, which goes well beyond Italy. Bling-bling, glamorous Champagnes share space with grower wines. Napa Valley and Bordeaux are also surprisingly well represented. As this is my first dinner at Carbone, I defer to some of my friends who are more familiar with the menu. 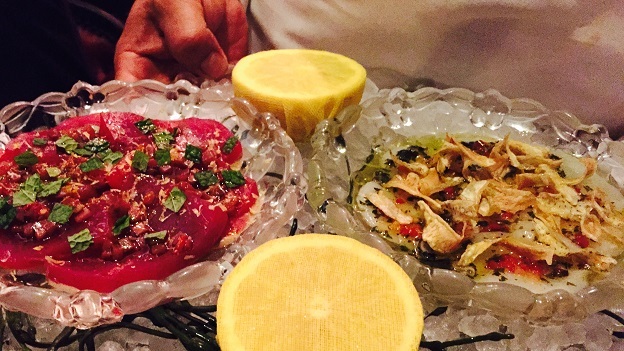 Our two crudos, tuna and scallops, are both delicious and also examples of the more contemporary Italian kitchen. No one was eating raw fish like this in Italian restaurants in the 1950s, that's for sure. 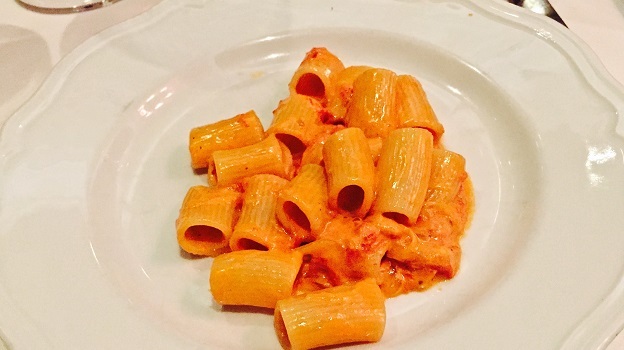 The Spicy Rigatoni Vodka, a Carbone signature, is bold and lusty, but not at all overpowering, although I would have preferred the pasta be cooked a true al dente. 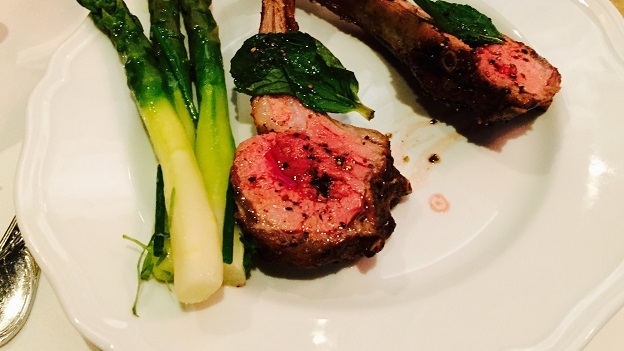 The grilled lamb chops are delicious, while a mound of perfectly grilled ribs is more than we can get through. The 1973 Dom Pérignon is a big wine to start dinner with. Powerful and vinous, it reminds me a bit of the 2003 because of its pure depth. It’s hard to see the 1973 improving much from here, but it has enough intensity to drink well for many years to come. Domaine de la Romanée-Conti’s 1990 Richebourg is one of the raciest Richebourgs I can remember tasting. Utterly explosive in the glass, the 1990 possesses superb richness and more than enough fruit to nearly cover the typically imposing Richebourg tannins. What a gorgeous Burgundy this is. Sadly, this bottle of Bruno Giacosa’s 1989 Barbaresco Riserva Santo Stefano is not among the best. The 1989 is supple and silky on the palate, but the knock-out aromatics and pure power that are signatures of the 1989 are missing. The 1966 Palmer is simply remarkable. Boasting superb pliancy for a wine of its age, the 1966 is incredibly deep and polished throughout. The flavors are broad, dark and inviting. We end on a high note with the sublime 1989 Rayas Châteauneuf-du-Pape. Powerful yet also super-finessed, the 1989 boasts extraordinary aromatics, seemingly endless fruit and striking inner sweetness. 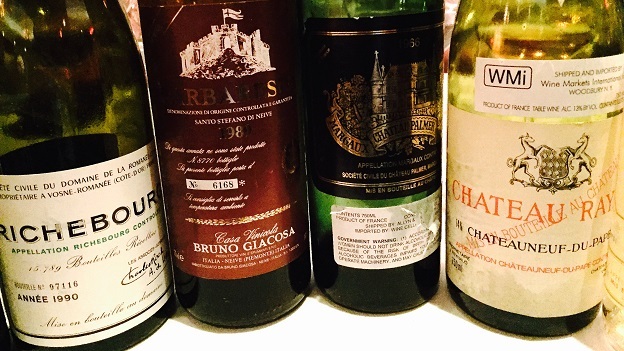 A real knock-out, the 1989 is hauntingly beautiful from the very first taste. The dessert cart looks positively dangerous, but on this night we opt to skip the sweets. I am sure there will be another occasion. Readers who want to visit Carbone should plan well in advance, as reservations are hard to come by. Prices are on the high side. Although the boisterous ambience is not especially suited to quiet night on the town, Carbone has a great vibe and an element of what I can only describe as childlike joy that underpins the entire dining experience.